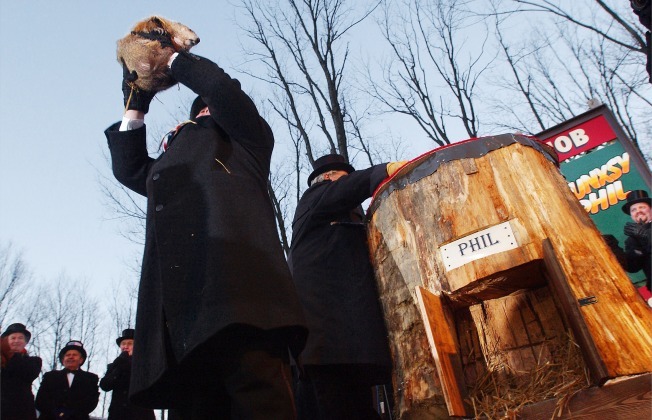 An official groundhog handler hoists Punxsutawney Phil above the crowd. Punxsutawny Phil saw his shadow. Staten Island Chuck did not. And who are you gonna believe? For those of you who enjoy observing bizarre pagan rituals whereby a man wearing a top hat and tails and sporting a handlebar mustache thrusts a terrified rodent into the air to splay his claws and shower bored-looking news reporters in vermin, this is big news. The rest of the New York can go back to muttering under its breath about the snow coming tonight and ignoring Staten Island again. Then, inexplicably, there is the odder-still Groundhog Day ritual in North Fort Meyers, where, as the Village Voice points out, it is already nearly 60 degrees and their master of ceremonies wears shorts with his top hat and tails. If Mona (come on, Florida, really?) sees her shadow, then what? Six more weeks of sunny and pleasant weather before the mosquitos come?